So… after a couple of awesome shows, we take some time to celebrate the holiday season. We’ll also be working on some new material and plans. We’re busy arranging bookings for the summer, and for the next season (’14-’15) and beyond. A big thank you to all who came to our cd presentation in the Qbus last sunday and made it an afternoon to remember! We were so happy and touched by your presence and positivity, you have no idea how much it meant to us:) For those who couldn’t attend, 3 voor 12, Yannick Raczynski-Henk and MuziekGezien all posted very nice reviews and pictures! For us, that is! If all goes to plan we’ll be holding/fondling/grapsing/drooling over the new cd before the week is over. The rest of you shall have to wait ’til june 16, when we officially release it with a rocking folkshow in the Q-Bus in our hometown, Leiden. But of course we hope to see your folk-lovin’ self at our CD release party! It’s going to be an Epic Party, with a special guest and new songs! (Yep, we’ve been busy and not just with the cd! As a matter of fact, we’re so excited about the new material that we’ll be premiering one of the new songs this coming weekend! It’s (currently) called Finvarra’s song and it’s entirely original material(meaning we wrote it ourself). Oh, did I mention yet that the door price at the release party will INCLUDE the new cd? So for €15 you get a full lenght Finfolkfest(1 hr of Finvarra folk) AND the CD! Good deal or what? Book your ticket early to avoid disappointment! Greetings! It’s been a while since I last blogged, but with good reason: we’ve been busy busy busy with our upcoming album. I know we’ve been promising it’s ‘almost done’ since forever, but guess what… this time it really is almost done! We’re extremely excited about it because we’ve had the pleasure of working with some very talented and skillful people. The man responsible for recording, mixing and producing the album is none other than the one who is also responsible for our live sound: David Groeneveld (not to be confused with the comedian), while the mastering has been in the hands of Sander van Der Heide at The Saint of Sound. But of course it doesn’t stop there: the shiny little disk needs a home! We are much endebted to the artists and photographers who gave us permission to use their wonderful pictures for the enrichment of our cd cover and booklet. One of these artists is the wonderful Noemi Valentíny. When we contacted her we were pleasantly surprised to learn that she herself is also a musician in the Czech folkband Pilgrim, who too are working on their first album! Be sure to check out her beautiful and unique art! 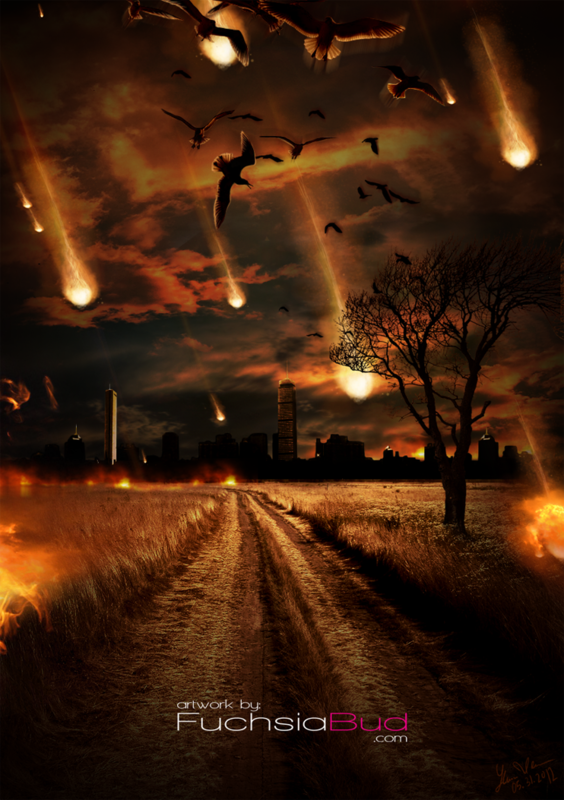 Just in case those Mayans were talking about the actual physical ending of the world instead of the shift in awareness some folks believe is going to take place(we favor the second option), here’s our heartfelt whishes. Have a good one! Having said that, if everything continues without so much as a hiccup, we’d love to see you at our end-of-year gig the 29th of december at the Razzmatazz in Oost-Souburg. The people at Razzmatazz have got into the habit of organising a two-day mini festival the last days of december because they ‘didn’t feel like quietly waiting around after christmas until new year’s eve’. We wholeheartedly agree! Cold, wet, rainy, gloomy, doomy, windy, chilly….where’s that mulled wine? Yep, autumn’s here with a vengeance. While we mourn the fact that summer nights at the BBQ aren’t going to come back anytime soon, we’re also very excited about our upcoming cd and gigs, travelling up and down the country like proper troubadours, so be sure to catch a show (or two;)! Currently we’ve got gigs planned all along the west, from north to south and back again, but of course we’re always working on securing ever more gigs in every region of the land. See you at one of the shows!